South African President and President of the African National Congress, Jacob Zuma, addresses delegates at the delayed start of the ANC elective conference in Johannesburg, Dec. 16 2017. South Africa's President Jacob Zuma has provided arguments on why he should not be prosecuted for corruption, the National Prosecuting Authority (NPA) said on Thursday, as pressure mounts for the scandal-plagued president to step down. Zuma, who has faced and denied numerous corruption allegations since taking office, submitted documents on Wednesday night to the NPA providing reasons why 783 counts of corruption relating to a 30 billion rand ($2 billion) arms deal arranged in the late 1990s should not be reinstated. The NPA extended the deadline to the end of January for Zuma to make his representations before deciding whether to proceed against him. 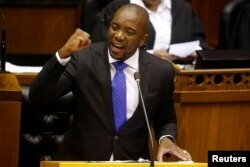 FILE - Opposition Democratic Alliance (DA) party leader Mmusi Maimane speaks during the motion of no confidence against South African president Jacob Zuma in parliament in Cape Town, South Africa, Aug. 8, 2017. South Africa's High Court reinstated the graft charges in April 2016 and the Supreme Court upheld that decision in October, rejecting an appeal by Zuma and describing the NPA's decision to set aside the charges as "irrational." Zuma has faced numerous calls to step-down with the ruling African National Congress (ANC) mounting the pressure after admitting to having discussed removing him as president before the end of his term.